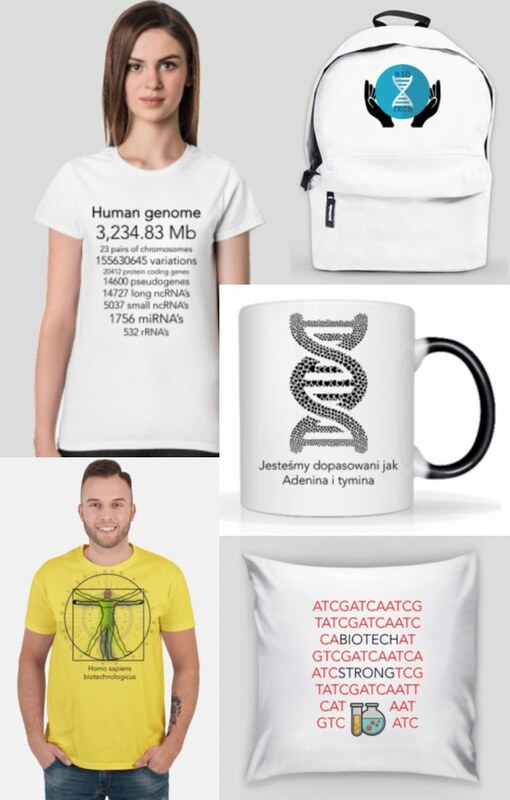 Podstawy komputerowej analizy danych pochodzących z ChIP-seq :: Biotechnologia: e-biotechnologia.pl :: Biotechnologiczny Portal Internetowy-aktualności, artykuły, laboratorium, studia biotechnologiczne. 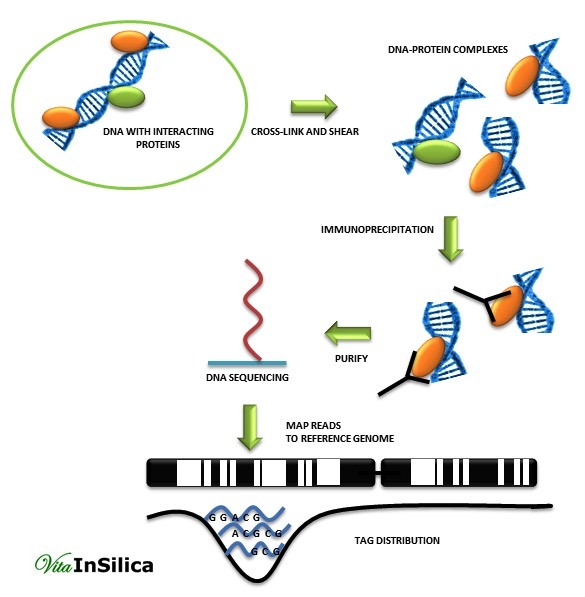 A lot of cellular functions strongly depend on protein-DNA interactions for instance: DNA-replication, recombination, gene expression, cell differentiation, cell cycle progression, chromosome stability and epigenetic silencing. Also chromatin is a combination of DNA and protein interactions. The proteins involved in maintaining the chromatin structure are called histones, including histone H1, 2A, 2B, 3 and 4. Histones bind to the DNA, package it tightly, change its structure to fit into the nucleus. Wrapped DNA carries the genetic information. Chromatin-coordinated genes control a variety of phenotypic changes in normal and diseased cells. The output of a ChIP-seq assay contains short nucleotide sequences which probably are the binding sites of a given protein. The main analytical steps of ChIP-seq data analysis workflow are: quality control, mapping, peak detection, motif analysis, annotation, and visualization. In the first quality control step filtering out reads with poor quality bases, adaptors or other contaminants is done. Next, mapping to a reference genome is performed using programs such as Bowtie, BWA, MAQ or SOAP. As the second quality control step, only uniquely mapped reads are kept, the rest is filtered out to avoid potential PCR or optical duplicates. Peak detection is divided into four main parts: creating a profile, selecting candidate sites, calculating significance (p-value), determining cut-off threshold (i.e. false discovery rate - FDR); and normalization (not fully exploited). Selection the peak detection algorithm and normalization method are core elements in the way to get meaningful interpretation of ChIP-seq data. Commonly used peak detection algorithms are MACS and SPP. In present peak callers differences can be found in terms of signal smoothing and background modeling. Selecting a threshold value is a great challenge. When p-values from the relevant distribution are available it is possible to calculate an FDR. The other way to rank the peaks is usage of the peaks height or fold enrichment. Mentioned methods are used in tools which calculate the FDR as a ratio of the number of peaks called in the control to the number of peaks called in the ChIP data. In the post-processing step tag-shifting effects are considered and the fragment size of the library is predicted. Software tools perform that step in different ways. SPP estimate a tag shift by calculating the autocorrelation between positive- and negative-stranded tag counts. CisGenome improves effects of SPP in the two-step analysis. PeakSeq has no automatic option of tag shift correction, but allows user to set the fragment lengths. There are also some specialized tools developed towards analyzing ChIP peak types exploiting a hidden Markov model and clustering algorithm in order to find meaningful patterns . The are two types of normalization methods – linear and non-linear. Sequencing depth normalization is the most frequently used linear technique, which makes the numbers of reads in two different samples the same by multiplying the number of reads by a scale factor. A variant of the above-mentioned method is used in PeakSeq. CisGenome, MACS, and USeq which use a normalization factor, focusing on normalization against control samples. Scaling is also used in RPKM (Reads per Kilobase of sequence range per Million mapped reads) normalization method. RasikaMundadea, HaticeGulcinOzerb, Han Weia, Lakshmi Prabhua& Tao Luacd, Role of ChIP-seq in the discovery of transcription factor binding sites,differential gene regulation mechanism, epigenetic marks and beyond, Published online: 30 Oct 2014.